Home Slot Machines So Much Candy for the sweet tooth! So Much Candy for the sweet tooth! The candy may look like those dollar store hard candy drops from Grandma’s purse, but rest assured that So Much Candy has potential to pay out a little more than those shiny nickels she used to give out! So Much Candy is a treat for casino gamers of all legal ages. The background music and candy store backdrop has the magic of Willy Wonka, but the sleek and colorful animation makes for a modern, appealing design. The standard 3 x 5 set-up with the 25 line norm is fully intact. 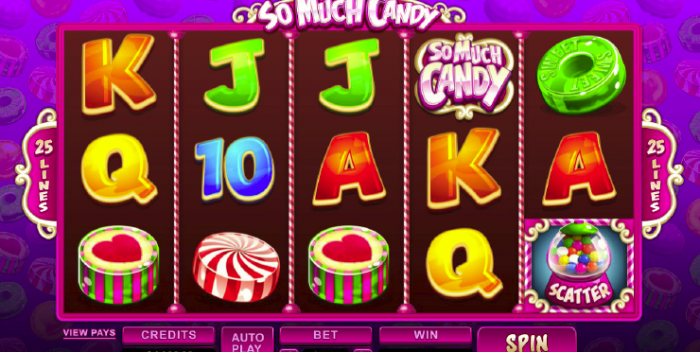 The wins are multiplied by the bets wagered, and the game can be played in a basic mode or Free Spins mode, just like its brother and sister, So Much Sushi and So Many Monsters. There is a lot of room for continued earnings with each new piece of candy (in the style of rock and fruit drops) displayed, up to an amazing 32,000. That’s a lot to be made from the comfort of your couch (or wherever you plant that tush)! The old school charm of a candy store makes the interface really sweet! The light music background is far from distracting and the gumball machine Scatter symbol looks neat. When 3 candies appear in a row, the Much More Candy feature allows a chance at more remarkable rewards. A High symbol can split into 5, while the Split symbol could help you reach a 25 of a Kind pay line! How many shiny nickels do you think that would pay out? 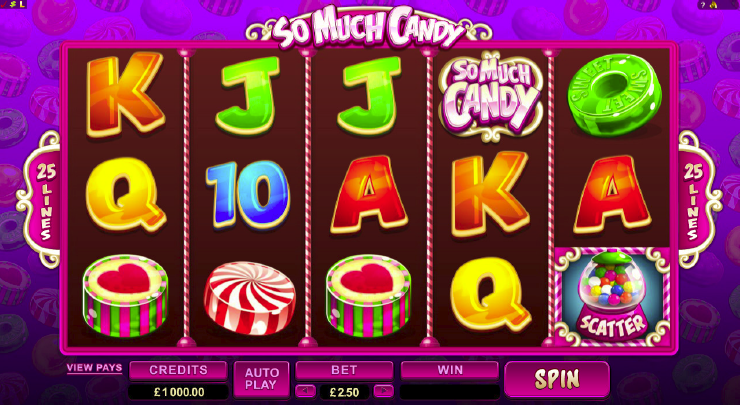 So Much Candy is another brilliantly designed game from Microgaming, and it’s a lot of fun to play. The speedy, energetic style should be a delight for a spirited generation of gamblers. Whether you let your sweet tooth do your bidding or live in fear of cavities, this game will give you a nice little adrenaline (or perhaps, saccharine) rush!